We were shocked when we learned that cutting cuticles at salons visits isn’t only discouraged – it’s often illegal depending on which state you live in! We had to ask ourselves, why then is the service constantly being offered during manicures? We spoke to multiple experts to find out the real truth behind how we should be properly caring for our cuticles, and what you need to know for your next visit to the salon. Cuticles are important to maintain and not to be removed. They are there to protect your nails from bacteria and infection. Always tell your nail technician not to cut the cuticles, just trim hangnails and loose skin that is visible after pushing cuticles back. “You don’t want the skin and hangnails tearing, which hurts and can cause infection. You are less likely to have cuticle overgrowth and loose skin/hangnails when you have your cuticles regularly pushed back and exfoliated by rubbing in a circular motion with a towel after the shower and keeping them hydrated,” says celebrity manicurist Lisa Jachno. Many people are cutting improperly and improper cutting can allow bacteria to enter the body. “Live skin should not be cut. It can also be an issue if tools are not properly sanitized for use and you are cut with them,” says Tee Hundley, celebrity manicurist and Pedicure.com contributor. Trimming or cutting cuticles during a manicure is purely cosmetic and doesn’t benefit the nail in any way. In fact, it’s actually harmful to your nails. “The small area of skin is there to protect your nails from infection. When this skin is removed, your nail is left unprotected from bacteria and fungus. Cuticles should never be cut or trimmed as it leads to infections and ultimately damage to the nail. This is something that seems impossible to get across to the nail technicians,” says Dr. Joel Schlessinger, a dermatologist and cosmetic surgeon, founder of LovelySkin.com. 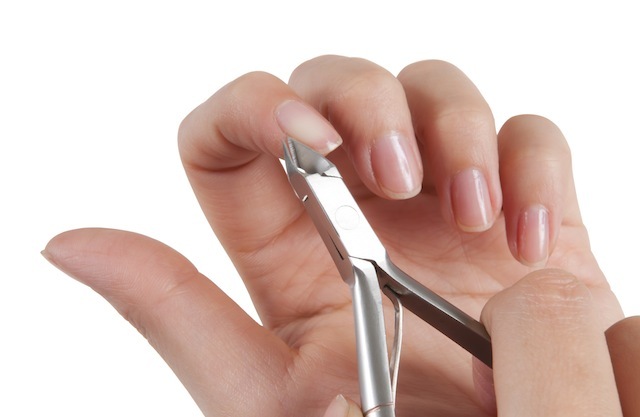 Trimming cuticles is especially dangerous when done at a nail salon, where the tools used in a manicure are rarely sterilized properly. These places often use tools and utensils from customer to customer without proper sterilization. “Many nail salons clean their tools by placing the utensils in a special solution where they need to be submerged for more than 12 hours in order to be fully sterilized. Nail technicians often leave them in for only 20 minutes or less, so the tools are never cleaned properly. If the nail technician trims your cuticles and then uses these utensils on your nails, it could lead to an infection or worse,” says Dr. Schlessinger. Why do salons continue cutting? Salons offer the option to cut cuticles because they know many people like how their nails look with the cutting. “The truth is if your cuticles are properly pushed (using a quality cuticle remover), and light nipping of any residual (skin that is no longer attached or “live”) your nails will look healthy and beautiful after your service. I would ask for a pushing, not a cutting,” says Hundley. We need to change this silly cultural assumption that cut back cuticles look better. It’s simply wrong! “Once we start cutting cuticles they become ragged or even turn red and infected and need to be trimmed again the following week. It becomes an endless cuticle cycle,” says Nailtini Celebrity Manicurist Elsbeth Schuetz. Good for your manicurist but bad for you.